iHACapp stands for intelligent Hygiene And Cleaning application. It is the new centre of hygiene, offering an easy to use all-in-one solution: custom cleaning plans, instructions, data registration, dosage system connection and product information. All in once device. iHACapp is the jumpstart for an important movement in the world of kitchen and building cleaning: and intelligent system becoming the centre of hygiene. The patented application and its physical location (a dedicated system in the workplace) ensures that all relevant information and knowledge is available where they are needed most. 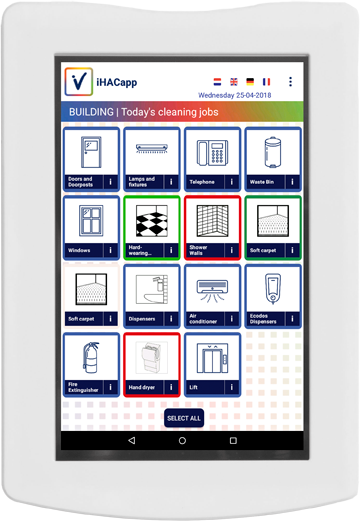 iHACapp combines all operational information: from cleaning plans and instructions up to registration and product information. Additionally it generates all data required for proper cleaning and hygiene management. In a world which is getting more transparent, you cannot take any risk by cutting back on hygiene. 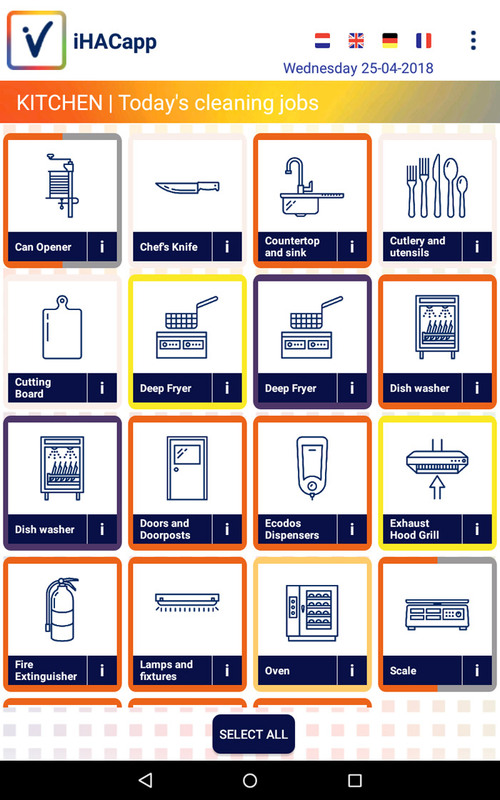 A quick glance at the system makes it crystal clear for the cleaner to know what his cleaning tasks are. When finished, he can check off his tasks with a single tap of the finger. The application works with a set of clear and unique icons and colours (corresponding with the products) and has multiple languages available.